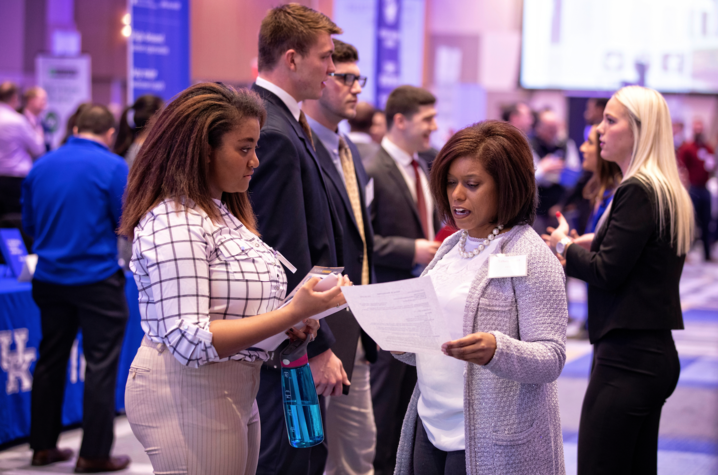 LEXINGTON, Ky. (March 19, 2019) — The James W. Stuckert Career Center will host an Education Career Fair from 3:30-6 p.m. Tuesday, March 26, in the Woodford Reserve Room at Kroger Field. Students and community members interested in working in the education industry are encouraged to attend the 2019 Education Career Fair. At the fair, students can expect to network with K-12 schools (public, private and charter), higher education institutions, and other education-related organizations and nonprofits. Students should come dressed professionally with multiple resume copies to present to employers. Free parking is available at Kroger Field. To plan ahead and/or view the event preview and employer list, visit Handshake. Make an appointment with the career center on Handshake. Email and phone appointments are available for those who aren’t able to meet in person. Visit the Stuckert Career Center for drop-in advising from noon-4 p.m. Monday-Thursday. For any additional questions, contact Rachel Hoover, assistant director of the Stuckert Career Center.